Using a Kumihimo foam braiding wheel and a few inexpensive supplies, anyone can create cords in a rainbow of colours and textures. Adding beads and pendants widens the spectrum - you will finish with a necklace which is totally chic and unique. 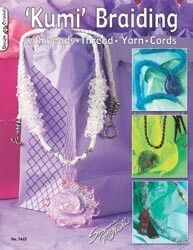 Make necklaces you will be happy to wear and proud to give as gifts. Paperback booklet 19 pages, with 21 projects.